Based on the square (reef) knot, the surgeon’s knot owes its name to its common use by surgeons to secure the threads in a suture. Though originally a surgical knot it has found wide use in fly fishing to effectively connect the leader to the tippet. It joins 2 lines of equal or unequal diameters as well as lines of different materials. When it is properly tied, the knot achieves almost 100% line strength. 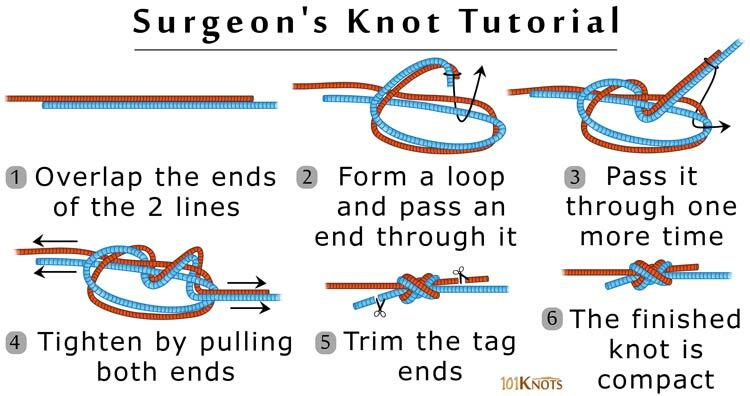 It is also referred to as the double surgeon’s knot since it is actually a double overhand knot with the entire leader passed through the knot twice. 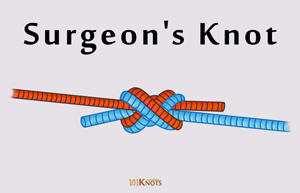 The triple surgeon’s knot utilizes 3 turns for added security. Similarly, it can be given 4, 5 or 6 turns increasing the complexity and bulkiness but adding strength. Hemostats and forceps are sometimes used as tying tools. A similar technique is applied for tying the surgeon’s end loop that can be attached to a hook or swivel. May slip while connecting a gel-spun braid to a fluorocarbon or mono leader. The double uni performs better. Not durable in light lines. The blood knot is safer. The tying method has been shown clearly in this video. Blood knot – Harder to tie but works best with lines of same diameters. Nail knot – Slimmer version but more complex. Needs a nail or any similar substitute for tying.